Her only hope is Noah—the wolf shifter she’s imprinted upon. She just needs to let him know where she is. But she can’t do it alone. Her only way to get a message to him is to team up with the other humans by making use of their unique gifts. But they have to do it fast. Because their time in the bunker is temporary. The demons are prepping them to go somewhere else… somewhere far worse than where they are now. 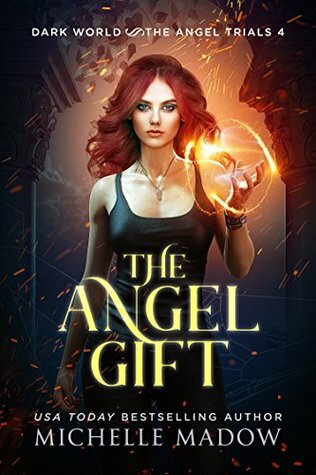 The Angel Gift by Michelle Madow is the fourth book in the Dark World: The Angel Trials series. This series is a spin off of Michelle’s Dark World: The Vampire Wish series but I don’t think it’s totally necessary to have read The Vampire Wish series although readers would certainly have a much deeper understanding of the world within and a glimpse at the characters that have crossed over to continue on from the end of that series. Like the previous series The Angel Trials is a urban paranormal fantasy read that includes shifters, witches and demons, vampires and nephilm. There is also mentions of the ending of the previous series and Annika who was the lead character so as mentioned starting with The Vampire Wish would definitely give a deeper understanding of everything. The story in this series is centered around Raven Danvers who was about to celebrate her 21st birthday. Raven’s mother claimed that she is a witch and insisted that Raven would gain powers soon enough but Raven was skeptical of magic. However when Raven was confronted by demons and saved by Noah, who is on a demon hunting task from Annika, Raven’s eyes were opened to a whole new world. Each book picks up right where the story has left off and continues on from there. As with all of Michelle Madow’s books the story is an incredibly fast paced and action packed adventure that still wonderfully builds the world and characters along the way. Each book will end with a jaw dropping cliffhanger that leaves readers anxious for the next in the series but then the next builds the action up even more and more. All of the books of the series have multiple points of view with Raven having been the strongest voice early on in the series but now it changes more often with the characters being split apart but to me each voice is still unique. As usual with the pace when finished I feel a bit of whiplash from the action and ending and can’t wait for book five coming in Dec. I received an advance copy from the author, many thanks to Michelle Madow for allowing me to once again read early. Glad you are still enjoying this series. Great review Carrie.